If you have just step in the wonderful world of blogging then you may not be aware about comment and track-back spamming. 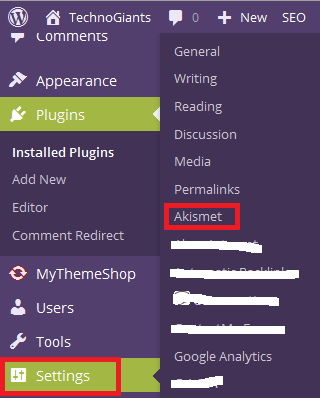 These things can easily destroy your blog with spam comments and track-backs but you are lucky enough that there is plugin which is pre-installed in [p2p type=”slug” value=”personalize-wordpress-website-custom-design”]WordPres[/p2p]s named Akismet. 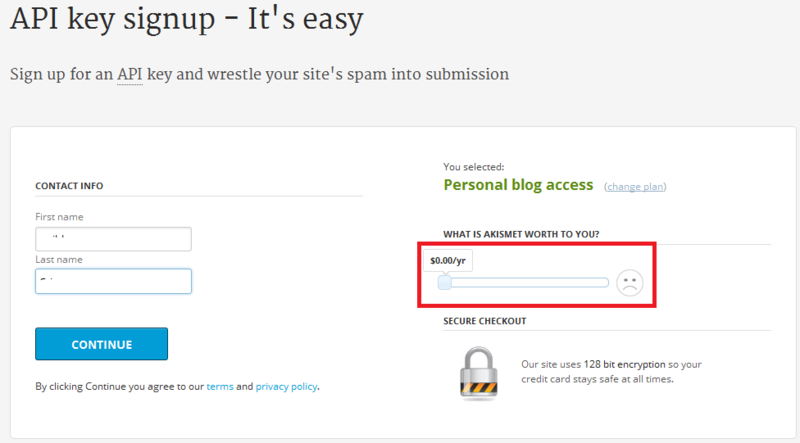 It’s a life saver plugin for every bloggers and site owners. Akismet is the popular [p2p type=”slug” value=”3-wordpress-plugins-help-bloggers-make-money”]WordPress plugin[/p2p] to prevent spam and it was developed by Automattic Inc. Most of the comments posted on your blog are SPAM and it’s very hard to stop but by using this plugin help you are able to stop SPAM easily. It comes pre-installed with WordPress but you need to activate it manually by entering an API key. Start reading this post, below you will find the step-by-step guide that helps to get a free API key. Step 1. Go to Akismet Signup Page, select personal plan and click on Sign Up button. Step 2. 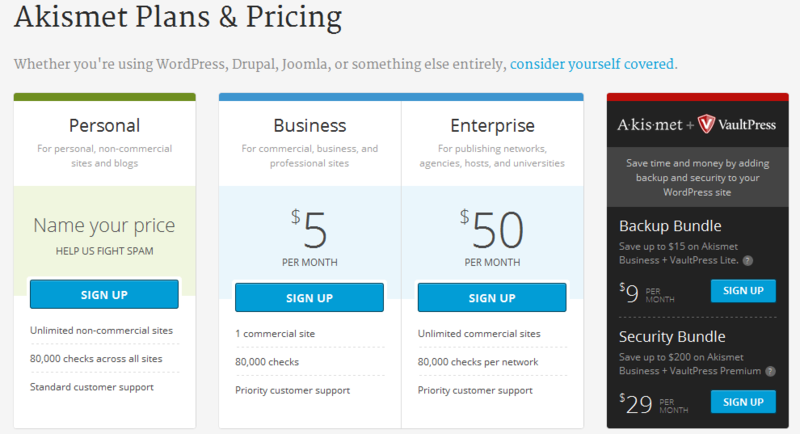 Create a new account for your use and if you already have an account on WordPress.com then sign up. Step 3. Once you have connected to Akismet with your WordPress.com account, select $0.00/yr by dragging the pointer, it will ask for your full name only and hide the Card Details to be fill. Click on CONTINUE button. That’s it. You are all done and on the next page, you can see your your free Akismet API key, as well the key will be mailed to your email id for future use. Never share your Akismet API key with others, its just like a password. In any case, if you not get that mail or key from Akismet simply go to Key Resend Page and enter your registered email or wordpress.com account email address and click on “Continue” button your will get your Free Key. 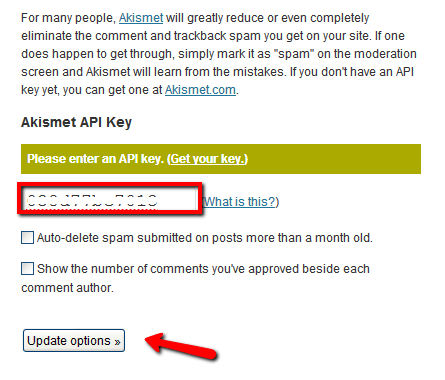 Now log in to your WordPress Dashboard and straightly go to Plugins > Installed Plugins > Activate Akismet Plugin. Click on Akismet Configuration page. On the Akismet Configuration page, Copy & Paste the API key into the text field which you get from the web page while signing up or from an email and finally you need to click the ‘Update Options’ button. 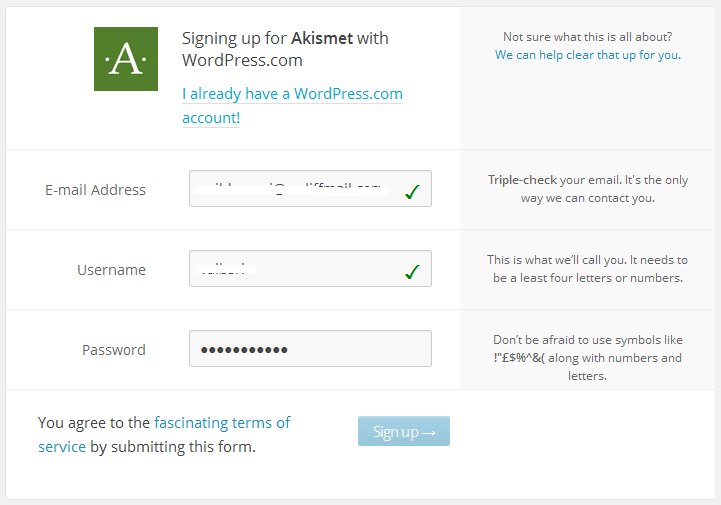 You have successfully activated Akismet for Free and your blog is safe from spammers now. I hope you like this article, kindly do consider sharing it with others and do let us know if you face any difficulties by leaving your comments.